Natural beauty, right in the middle of the city – the botanika, Germany’s first Green Science Center – makes it possible. Located on the grounds of the famous Rhododendron Park, you can see the flora of the world and make fascinating discoveries in biodiversity and plant ecology with a visit to the botanika. Asian landscapes, a butterfly house, and a botanical garden allow you to not only experience exotic nature and culture in a new way, but also our own native ecosystem as well. In the tropical greenhouse, follow the path from the Himalayas down through to Yunnan, Burman and New Guinea. 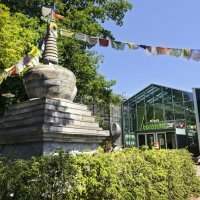 Original exhibits such as a prayer wheel, a Chinese tea pavilion, and the largest Buddha statue outside of Asia, accompany you along the way. There are also numerous exotic varieties of Rhododendrons for you to enjoy. With its many interactive activities, the Botanika is a destination for the entire family. The unique atmosphere of the botanika also makes it a terrific space for events and parties, like a child’s birthday or even a wedding. Wander through a sweet-smelling meadow, observe a bee colony at work, or fInd out what it feels like to be the fly inside a carnivorous plant. In the Discovery Centre of the botanika you’ll experience the plant and animal world in a new, unusual way. 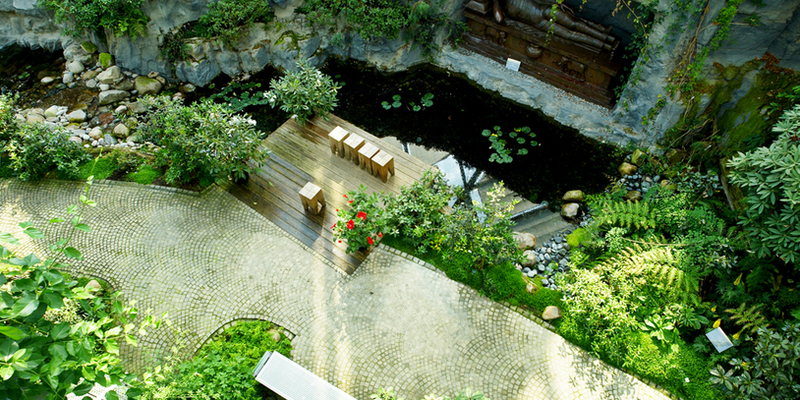 The numerous interactive stations and exhibits bring you nearer to the wonders of nature, step by step.